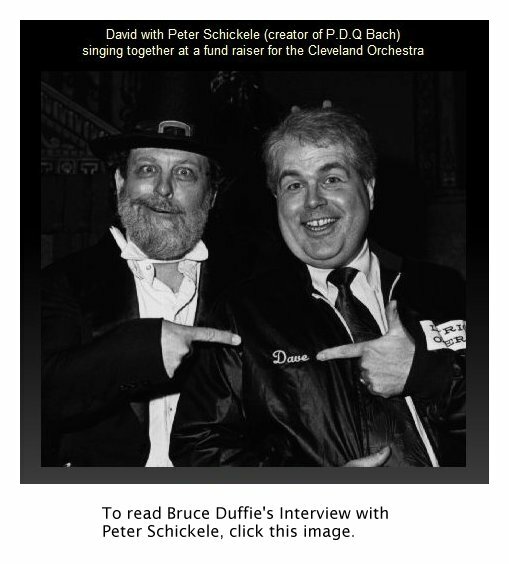 David Gordon Interview with Bruce Duffie . . . . . . . . .
Like those in the medical profession, musicians begin their studies by learning and performing works in many styles and from all (or at least most) periods in history. Soon, however, they begin to narrow their scope and specialize in one kind or a single period. It is rare, but a few performers continue in more than one, though usually this takes the form of early-and-late with a big gaping hole in the middle. Among the singers, many Baroque specialists also lend their voices to new works, especially of the chamber variety. 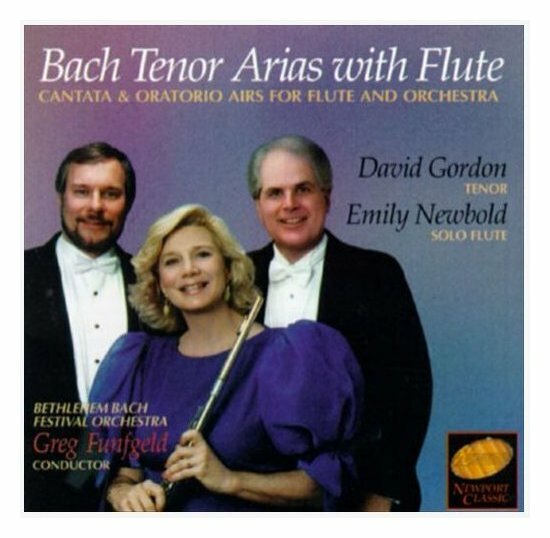 The fine lyric tenor David Gordon is the exception to this generality. His repertoire encompasses both the Baroque and Modern, and also included roles in the Romantic list that has become standard fare throughout the world. He started out doing "comprimario" parts as a member of the Lyric Opera School (now the Ryan Center for American Artists) in Chicago. He went to Europe and spent a few seasons doing a large variety of larger roles, though always staying within his compass and not succumbing to the temptations of being too heroic even in small houses. He also remained faithful to the old and new, and came back to the U.S. in order to do those pieces more regularly. We got together in the fall of 1981 for our chat. 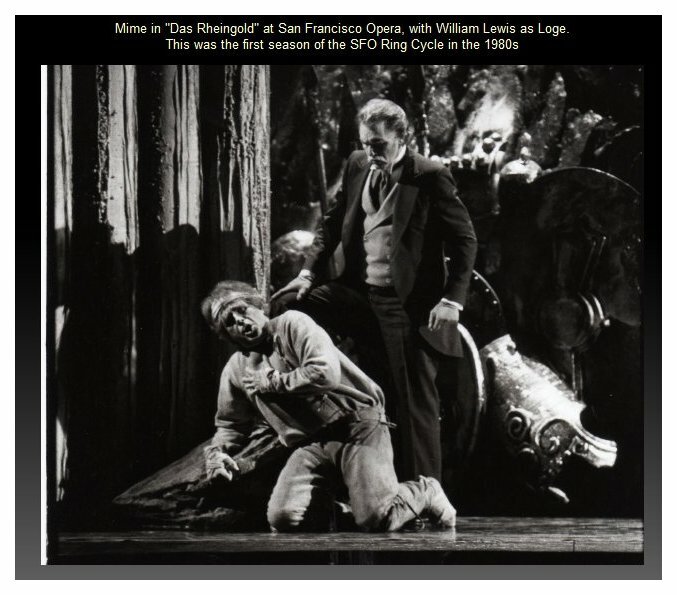 Portions appeared the following year in Opera Scene Magazine, and the sections about Wagner were published in Wagner News under the title A David Named David. Remember to pronounce it correctly in your mind's ear, "A DAH-veed named DAY-vid!" Audio excerpts were heard on WNIB in conjunction with his recordings several times in subsequent years. As we were setting up, the subject of new music came up, so that is where we began . 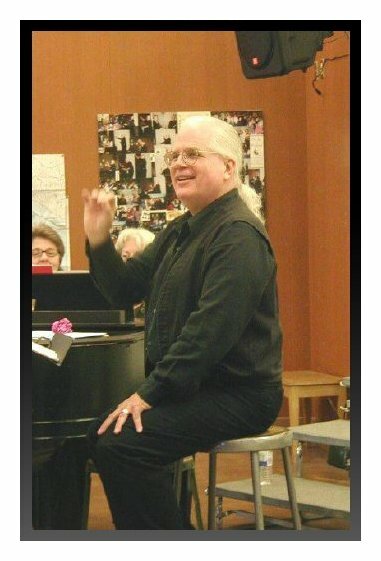 . . . . . .
Bruce Duffie: Do you enjoy performing 20th century music? David Gordon: Yes, very much. I'm very committed to it, actually, for a lot of reasons. BD: Even when it's all over the staff? DG: I can't do everything that I'm offered, so I try to pick and choose. It's a question of idiomatic writing for the voice more than anything. The first half of this century brought a lot of experimentation for a lot of reasons both musical and non-musical. Now, in the second half of the century, there seems to be a movement, first of all, a return to a traditional concept of beauty, which is very welcome. Along with that comes an idea of writing for the beauty of the voice. I remember seeing Charles Reiner, the well-known Canadian pianist, play a contemporary concert ten years ago. He was there in white tie and tails, and he did nothing during one piece but roll tennis balls around on the strings of the piano. This is useless. It ignores the potential of the piano and certainly ignores the potential of Charles Reiner. I feel the same way about singing. BD: Is that just an effect? DG: Yes. It's really just an effect. I don't mind the effect, but I mind the fact that you've got to hire a first-rate pianist to do it, when anybody could do it. Literally anyone could do it, even a tone-deaf person. There's a lot of vocal music that a lot of tone-deaf people could actually sing better than people with relative pitch because there is less to confuse them. Nobody would know the difference. I remember Peter Pears saying in an interview that he went on a tour with Britten doing songs of Berg and Webern, and he said he never got more than 60% of the notes right, and it was a different 60% each evening. He described them as "frantically difficult." BD: But those composers wrote actual notes. A lot of modern composers just give indications and approximations. DG: Sure. I remember Pears saying that one night someone came up to him after a concert and said he had never heard the songs sung this way and Pears replied that he probably hadn't! First of all, great composers have always created turmoil in their lifetimes because they're forward thinking, and very often they're very far ahead of their time. It's only because of committed performers that the music gets performed and gets heard and becomes part of the mainstream. BD: Do you think some of the things today will become mainstream, or is it too far out in left field? DG: Who knows? Who knows what people will be writing fifty years from now. They may look back on us the way we look back on Elgar and Vaughan Williams and say how reactionary and neo-romantic. It's really hard to say. BD: We wonder if people will be writing 50 years from now . . .
DG: Well, that's a non-musical question. BD: Do you prefer singing a melody? DG: Of course. Very much so. The voice does certain things best and that's what I try to do, not only for aesthetic considerations, but to protect myself. I got into some really deadly things when I was a McGill University ten years ago. We had a very active composition school and I started doing the kind of screaming, yelling, sliding, scooping, squawking thinks that can really damage the voice, especially in an operatic situation where you have to produce a lot of volume. In chamber music you can hold back a little bit. BD: These were operas you were asked to scream in? DG: Well, both. 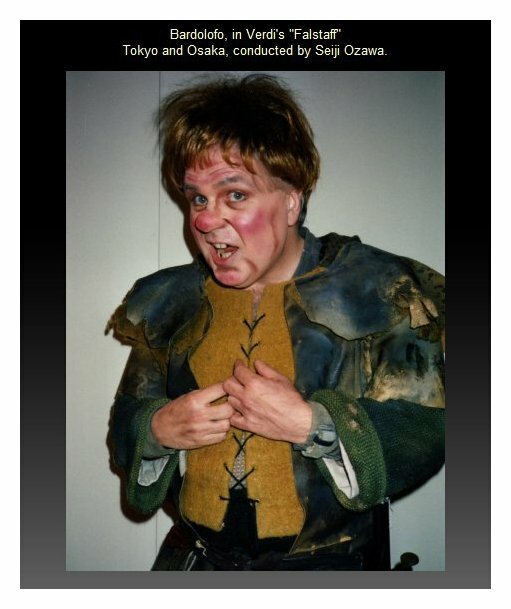 In Europe I did a bit of contemporary opera that was difficult, but singable. I do about 14 or 15 concerts a year with this contemporary chamber group which is more or less supported by the Smithsonian. We do concerts at the museum and have made a couple of recordings. It's a great challenge. BD: Are these all world-premieres? BD: Apparently it's not terribly difficult to get a first performance, but the trick is to get that second and third. DG: Right. One piece I've done several times is for tenor, percussion and synthesized tape, and it's great! People really dig it. 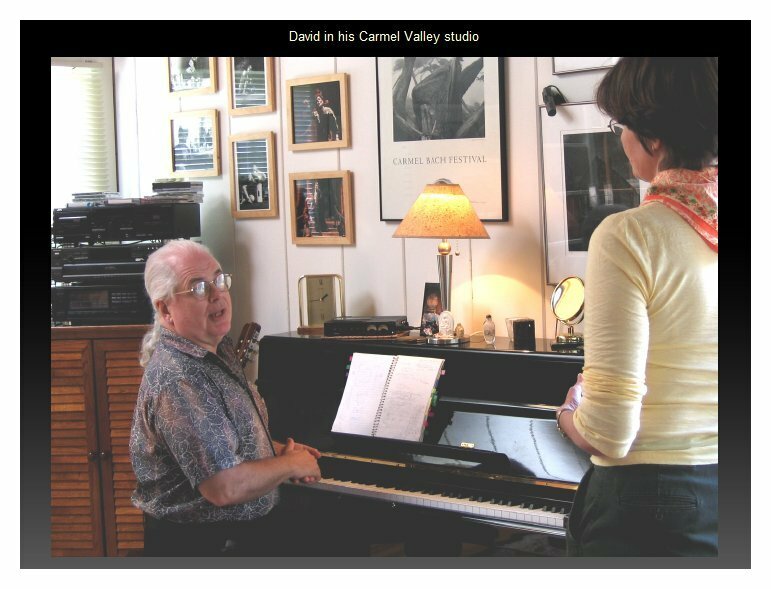 [This is Cantata for Tenor Voice, Percussion, and Electronic Sounds by Maurice Wright. 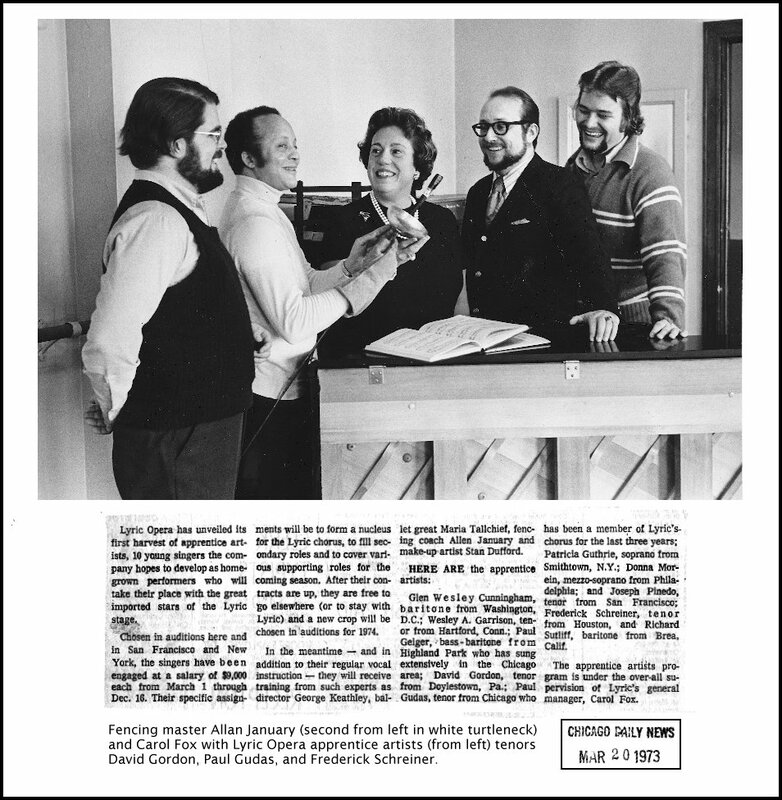 It was recorded as part of a two-LP set on Smithsonian Collection Records by the 20th Century Consort, as seen in the photo at left. Gordon was also featured with the same group on their recording of Into Eclipse by Stephen Albert which was later issued on Nonesuch Records.] It's something that audiences can enjoy on first hearing. The greatest compliment I can get is when someone has been dragged to the concert and then really enjoys the piece! So I think it's up to me as a performer to do more of this kind of music so people will hear it and like it and come to know and have a better outlook for it. I'm very committed to this music and it's a wonderful change from opera. It disciplines you in a very good way. BD: So you always want to do both. DG: I'm trying very hard to keep one foot on the dock and one foot in the boat. It's not easy. I was in Austria for four years singing lots of opera. BD: Is that still a good thing to do? DG: Yes, but it's not easy to do any more because there are many more fine European singers coming along. In the 50s and 60s, a whole generation had been wiped out so it was pretty easy to get a job. But now it's much more competitive. 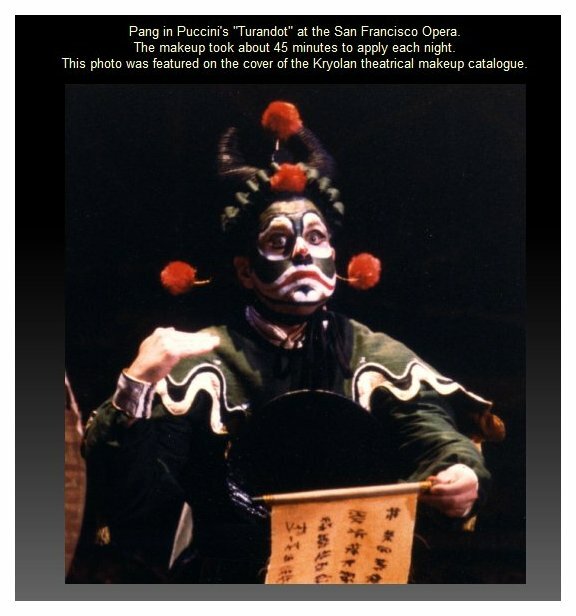 In four ten-month seasons, I did about 330 performances of about 10 or 20 operas. I did lots of roles, big ones and smaller ones. It was a repertory house, and that's where I learned my craft. But I got tired of doing nothing but opera. It was an ensemble theater, and they owned you for those ten months. You literally had to get written permission to go out of town. When my contract was up there, I had offers from two other houses to do roles on the same kind of contract and I decided to come back here and I haven't regretted it at all. 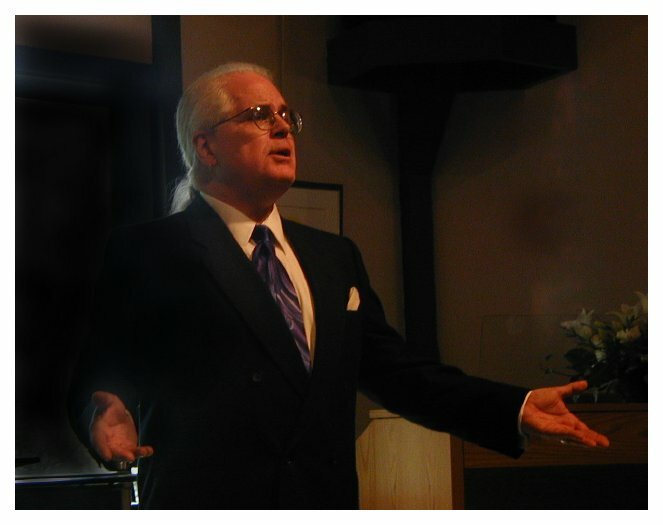 Now that I'm home again, I do these contemporary concerts, plus I sing in a couple of early music groups as well as operas. But this is precisely the reason I came back, to be able to do troubadour songs and renaissance stuff plus the new things. BD: Are you to the point where you can write your own ticket? DG: Almost. I am to the point now that I have a few too many engagements to accept, and that makes me real happy. BD: Then, a question I ask all singers. How hard is it to say no? DG: For me, it's pretty easy. It depends how attractive the engagement is. If it's something that you really want to do, it's pretty easy to over-extend yourself. I find it easy to say no because I simply cannot have a constant switching of centuries. Also, as a singer with a light, lyric voice, I have to watch out for my own health, the physical health as well as the vocal health. I must have time to rest and I must have time to study new roles. So far, only a few things have been repeated; all others have been a one-shot production. BD: How do you decide what to study? Are they things you've been asked for or things you feel you ought to know? 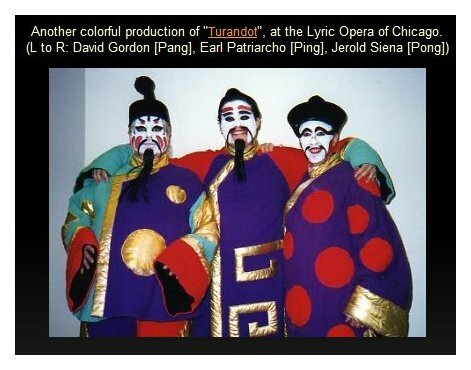 Also, during the seasons 1974 -80, Gordon participated in several "Outreach" performances at schools and other local venues presented by Lyric Opera. 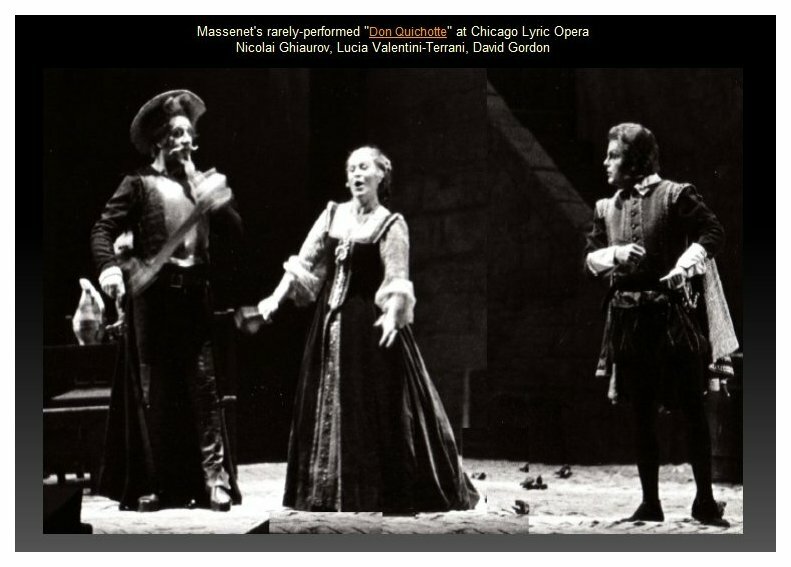 The repertoire included Il Ciarlitano (Ernesto) by Domenico Puccini [American Premiere], Barber of Seville (Almaviva), La Traviata (Alfredo), and Don Pasquale (Ernesto). BD: Is it a plus to be at Lyric to work with several world-class maestri? DG: Yes, and also to be able to audition for Janowski. He's swiftly becoming a giant of a conductor. I would love to sing Meistersinger with him. BD: You don't have any aspirations to sing Walther? DG: No, no. When I was an undergraduate, I dreamed of Otello and Don Carlo, you know all that stuff, but it was pretty easy to put aside. BD: Why is it that when you're nineteen you dream of doing Otello rather than Almaviva? DG: When you're nineteen, your musical tastes and intellectual abilities are not so refined. Otello just hits you. It gets you below the belt. It's real easy to just get thrilled with Otello. BD: But you still enjoy attending Otello? DG: Oh sure! It's one of my favorite operas. BD: Are you good audience? DG: Not really. I'm one of those who sings along silently and gets a tired throat. There are singers who can't listen to other people sing. I'll go if it's a really good cast, but if it's an opera I've studied, I have the ideal performance in my mind -- a performance that does not exist anywhere. I tend to be a perfectionist, and so I'm often just not satisfied. There are some who go to the opera every night -- mostly young singers. BD: I could see going to Don Quichotte seven times because it's likely you'll not see it again, but not Bohème which will be done everywhere all the time. DG: But I could go to Bohème lots because it's an opera I never tire of. BD: Are there any operas you hate? DG: Faust. I just find it trite. I'm just not a Gounod fan. I'd rather hear a work by Massenet twenty times than hear Romeo once. DG: [With a big smile] Well, not with this cast... I would go to hear Alfredo Kraus sing absolutely anything in any key. BD: Do you enjoy singing bigger roles rather than smaller roles? BD: I remember you as the Simpleton last year in Boris. You were not onstage very long, but it's very important. DG: It's very significant, and that was a tremendously satisfying experience for me. Everding is a great director and he had the character on stage a lot of time when there's nothing to sing. He expanded the role for me. That made it possible for me to make a great impression on the audience. There's really hardly anything to sing, just the little song and the tiny duet with Boris, but not much else. I enjoy doing that kind of a role if it's possible to make a mark. I like to act, and can get into these wacko characters like the four characters in Hoffmann. [See photos below.] I've done Vašek in the Bartered Bride maybe 40 or 50 times, and there are lots of ways to make it an enjoyable character that have nothing to do with singing. 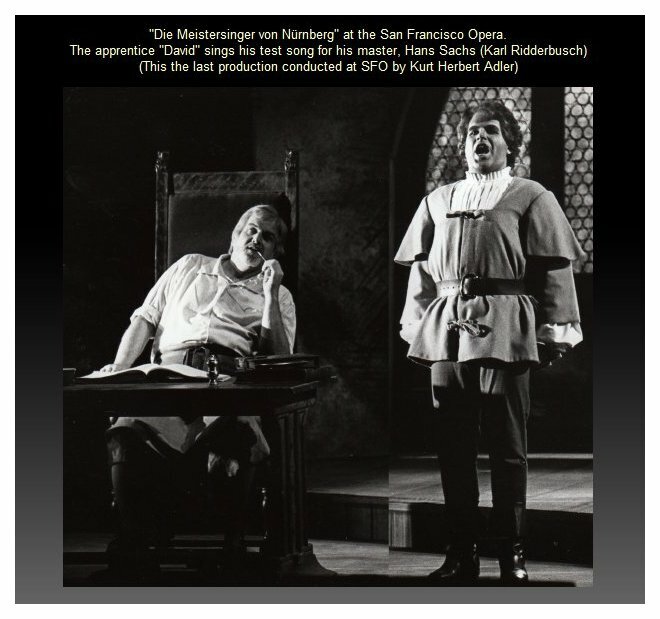 David in Die Meistersinger is not really a minor role, but it's a minor role compared with the other roles in that opera. BD: The other roles are simply enormous. DG: Right. I enjoy doing both, and I'm lucky that I can do both. I can do Rossini roles and the public wants them. BD: [With a gentle nudge] Does the public want them or are they told they should want them? DG: That I couldn't tell you. It's not a question of what they want, but what they kind of expect. They have sort of subliminal expectations. BD: Is that partly based on what they hear on recordings? DG: Sure. I'm very fond of the Barber of Seville, and know it better than any other opera. I've done different editions in English and Italian and German. I know this critical edition by Alberto Zedda which people are starting to use now. BD: Why is it better? DG: It's cleaner. It does away with a lot of "traditions" which are merely singers' self-indulgence that have become obligatory. Rossini's big idol was Mozart, and when he was in Paris, Rossini was referred to as the "Mozart of the Boulevard." He was their heir to the Mozart tradition. When you do Rossini in a classical style, it takes on a whole new life and a whole new sheen that it doesn't have if you just put cadenzas three or four to the page. The cadenzas started because sopranos started taking over the mezzo roles and the parts needed rewriting. So when the sopranos started taking liberties, others followed and it turned the opera into a slapstick, which it very definitely is not. BD: Do you feel that you're competing against recordings all the time? DG: Yes, very much so. Not only vocally, but musically. Isaac Stern said that his worst enemy is his own recordings because they're all perfect. He never breaks a string, he never goes out of tune, he never misses a note on the record, and that's the way it is for singers too. BD: Does the cut-and-piece method made recordings a fraud? DG: Yes, of course it does, and yet would you want to buy a recording where the performer flubbed a note? You'd year that mistake every time! You'd begin thinking about it earlier in the record and it would become an obsession. It almost has to be perfect, and yet it's a fraud in that it's not anything that can be recreated live. Digital recordings are interesting in that regard because as I understand it, it cannot be edited the old way. So while there's a certain amount of mixing and re-mixing, the splices are fewer. Janowski was telling me about his project of the Ring in Dresden and I heard part of Rheingold It's wonderful. The Dresden Staatskapelle is a wonderful opera orchestra, perhaps the best. BD: Let's talk about Die Meistersinger. Do you like the part of David? DG: Oh yes, very much. BD: Is it schizophrenic for David to sing David? DG: No, not in the least. BD: It wouldn't be easier if you were Frank Gordon? DG: No. I love David; I love Meistersinger. I always have. 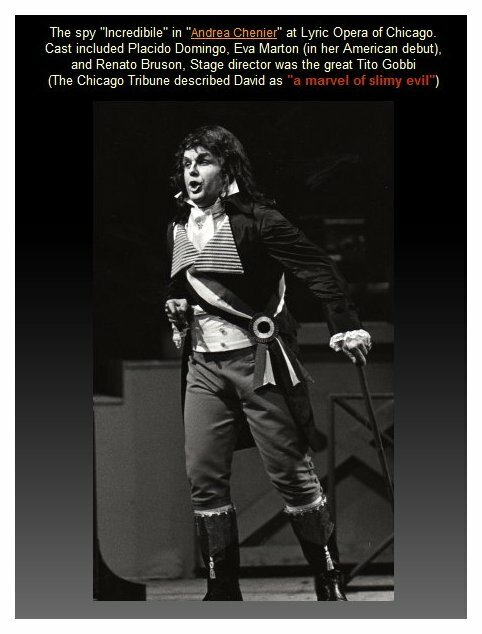 I saw it for the first time in 1978 in Vienna with the same people (except the tenor) that I sang with in San Francisco. BD: Did you know then that you'd be up there with those people? DG: Oh, no. In fact, I learned David in about four weeks. I was originally hired in San Francisco at the last minute because Terry McEwen had heard me here as the Simpleton. They hired me then to do Vogelgesang in Meistersinger and Borsa in Rigoletto. Another singer was hired to do David, but he got very sick, so they didn't know if he would be well enough to sing. So a month before I was to report there for rehearsals, they called to ask if I'd learn David. I'd heard it for years but I really learned it in four weeks. It's one thing to hear it but another to know it to sing it. I had done my homework and was ready for the pressure out there. I enjoyed it thoroughly. It's an opera you can hear 1000 times and always find something new to like. I like the role, I like the character. It fits me vocally and temperamentally and physically. I'm a perfect David in that respect because I'm agile on the stage and the right age. It's a great challenge because musically it's very complex. BD: What was your reaction on realizing you'd be singing that role with those people? DG: I was thrilled. To sing David with Karl Ridderbusch was absolutely the thrill of my life because I've admired him for ten or fifteen years from those recordings of Bach with Harnoncourt. He's a towering character on the stage. He plays a very stern and almost too severe Sachs. He mistook me for Kenneth Riegel and thought we had done it together here in 1977. I couldn't understand why he was being so brusk with me in rehearsals. He'd say, "Come on, you know this," and I thought about the fact that six weeks ago I didn't know a note of the part! I finally told him this and he was so apologetic, and realized that I was just starting out with the role. He was very helpful. By the end he was kind of a father-figure. It was a great thrill to do it and I'd like to think that I lifted myself to that level. I got terrific reviews and it was a great personal success. It was my debut there, and I think it will lead to a lot of other good things is San Francisco. BD: It's much better to debut as David than Vogelgesang. DG: Oh, God, yes. Terry had seen me do other things and he was the one who hired me. In fact, I had to overcome a little hostility from Mr. Adler because I had been hired for the smaller role and then hired for David, and he'd never heard me sing. So I had to prove myself and that made it doubly hard. But it was a success. It's a wonderful role for me and lots of fun to do. BD: So if you sing it again with Ridderbusch, you will know it. DG: Yes. He's one of those singers who has little bits, little gags and little mechanical things that he just does every time within the staging or concept or design. He has all his own costumes and he has all his own shoemaking tools and equipment that he brings with him. He was a great Pogner for years, and when he first studied Sachs he worked with a shoemaker in Vienna for three or four weeks, going every day to watch and learn, so when he's onstage working with the leather, he really looks like he knows what he's doing. BD: Is he actually making a pair of shoes? DG: Not quite, but he's got all the little tricks. For the wonderful hammering during Beckmesser's aria in the second act, Ridderbusch has a piece of tanned leather with uneven edges, and written on that piece of leather are the notations for the hammering. He takes it with him and sets it on his little bench! BD: That's great! The same kind of trick could be used in Siegfried when he forges the sword. DG: Yes, really! I learned a lot from Ridderbusch. I learned how to build on certain little moments, certain movements, certain physical bits, to use them sort of as your buoys or as your lighthouses; to build your character depending on the particular staging around that and use those to keep the continuity. BD: It seems like that would make him a bit inflexible to the various quirks of any night. DG: He reacts if it's big enough to react to, though in many ways, doing bits the same way means that you don't have to think about those details, and you can concentrate more completely on the singing. That part especially takes so very much work to sing that any extras that you can forget about leaves you better able to cope with this "frantic" part. Now in this production, I made friends with Kurt Rydl. He's Austrian and I'm adopted Austrian so it's obligatory for us to go out after the performance to drink beer. He was telling me that he's got his eye on Sachs. He's doing Pogner now, and maybe in about fifteen years he'll debut as Sachs. It takes fifteen years to learn about Sachs -- not the notes but the role, the character. BD: I prefer the bass in that role rather than the baritone. I know the baritone should sing it, but every time I hear a bass in it, I'm happier. We were waiting for years for Fischer-Dieskau to sing Sachs, and we were all a bit disappointed in it. DG: Yes. He's just a bit too refined, too intellectual. I could listen to him sing Schubert all day, but his Hans Sachs is always a bit Fischer-Dieskau. Ridderbusch is a different type of persona, and this comes through in his Sachs and makes it a forceful kind of character. It was a great pleasure working with those people and a great challenge too. BD: Tell me a bit about the character of David. DG: He doesn't really have Meistersinger potential. I think the only reason Sachs has kept him on so long is because of that little song he wrote. It's so lovely, but he's kind of pedantic and he doesn't really have any genius. BD: He's not a wimp, though, is he? DG: No. He can be clever, but he's not tremendously insightful. He's horribly impetuous. He does things without thinking. He jumps out of the window and beats up on Beckmesser and breaks his lute! BD: Do you think that David and Magdelena are happy? Do they ever get together? DG: Not in this production they didn't. Usually they are united at the end, but I never got her. I don't know really what the story is with Magdelena, and I don't know what they've got going on. I don't know what she's getting in return for all the food she gives him. I'm sure he's got the hots for her, and that's one of the reasons he's so anxious to have Sach marry Eva. In the beginning of the third act, he tells Sachs he should be married, and that he could beat Beckmesser without any problem. He knows that if Eva moves into Sachs' house, Magdelena is going to move in, too. BD: Does that have any bearing on why Sachs pushes Walther to Eva? DG: No, I don't think so. At that moment in the third act, Sachs is so preoccupied with this crisis in his life. It's a horrible decision that he has to make. He sees the truth, but he doesn't feel it. His hormones are working against him and he has true love for the woman, but he realizes that it's got to be her and Walther, that Walther is the ideal groom for her. He hardly picks up on what David is singing at all. Wagner specifies that Sachs is sitting there kind of looking off. He's been there all night. David apologizes for this and that and then realizes that it's his name-day! He offers him the food and Sachs doesn't want it. He's just thinking about Eva. He's had a dream, but if Walther hadn't showed up, maybe it would have worked out. Sachs is the best man for Eva in the village, in terms of noble bearing and character, but this upstart comes into town. Sachs is a wise enough man. He's a towering character, it's overwhelming. If you get into the libretto, I think it could be performed as a straight play. It's so poignant and poetic, and you realize what a marvelous figure this Sachs is. You have a feeling that many of the musical things he says in the last scene are Wagner speaking to you. I'm grateful to Wagner for writing David. It is a significant part. Usually it's Cavarodossi and Spoletta or Pinkerton and Goro. David is really interesting and grateful to sing. BD: Do you want to sing the role of David again? DG: Oh, yes, definitely. I'd give up something else to do it. 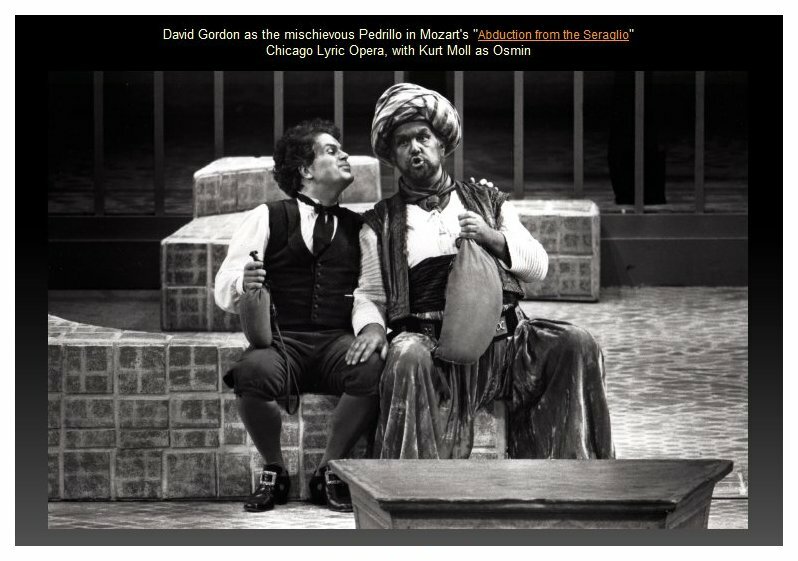 I learned the notes in four weeks, but it was only after the last performance, when I could relax, that I started getting into the psychological implications of the opera. Now having lived with it for another year or two, I'd come to it fresh. Oh, I'd love to do David again, but I'd hate to have to do it in English. DG: I speak German and I'm real attached to the language. It would be difficult because I'm spoiled. BD: You've sung other things in translation, so how do you feel about translation in general? DG: It depends on the opera. 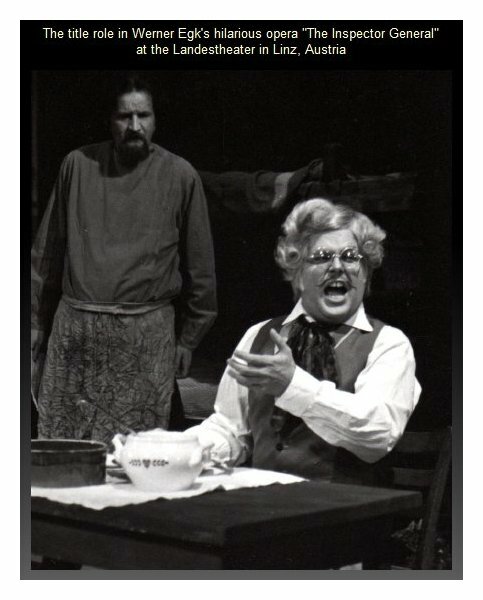 I enjoy Così or Barber in translation because of the recitatives and because there are gags that the audience gets. In Linz, where I sang for four years, we did only one production each year in the original. They instituted that my last two years there. Before that everything was in German. It can make a difference with comic operas, but with certain operas it doesn't really make any difference. The Germans certainly put more emphasis on text than Americans. They want to understand every word. It depends. So many things are done in English in the States and you still can't get too many of the words. BD: Do you work harder at the diction in a translated opera? DG: Sure. That's the only point of doing it in translation. BD: Harder than singing in the original where the audience speaks that language? DG: Well, I can't say. I've sung only in English and German speaking countries, and I've been working equally hard on those two equally difficult languages. I prefer, as a singer, to sing in Italian because it's the nicest language to sing in. I'm happy to be doing Elisir (here in Chicago) in Italian. BD: Would you have turned it down if it had been in English? DG: I don't know. I'd have had to talk with other people about it and decide if I would ever do it again in English. It's a lot of work learning a role in English and getting it into your voice. It's a long role and you have to pace yourself very carefully. BD: Wouldn't the vocal stamina be the same? DG: It's not only the shape of the words, it's the vowels that are derived from other sounds. In that respect, German is similar to English because of the strange vowels, such as the umlaut and others in terms of the way you sing them. You have to watch very carefully to preserve the tone even though you've got all these consonants. In French you can glide over that a little. I like singing in French, but there's not a whole lot of real good repertoire for me that's done here. It's very pleasant; it's smooth and an elegant language to sing in. Italian is very much easier because the vowels are very comfortable. They're all more or less "pure" vowels, and there are fewer consonants. In the Italian performing traditions, as well as in the music itself, is an appreciation of the legato line. The Italians look at it as opera; the Germans regard it very much as theater. DG: They're more in the Italian tradition. They want to hear beautiful singing. Again, I've been spoiled by being in German-speaking countries because the emphasis is placed on being able to understand the words that are being sung and the ability to create the theatrical event. The Germans can do this because they have at least twice the amount of rehearsal time as we have here in America. 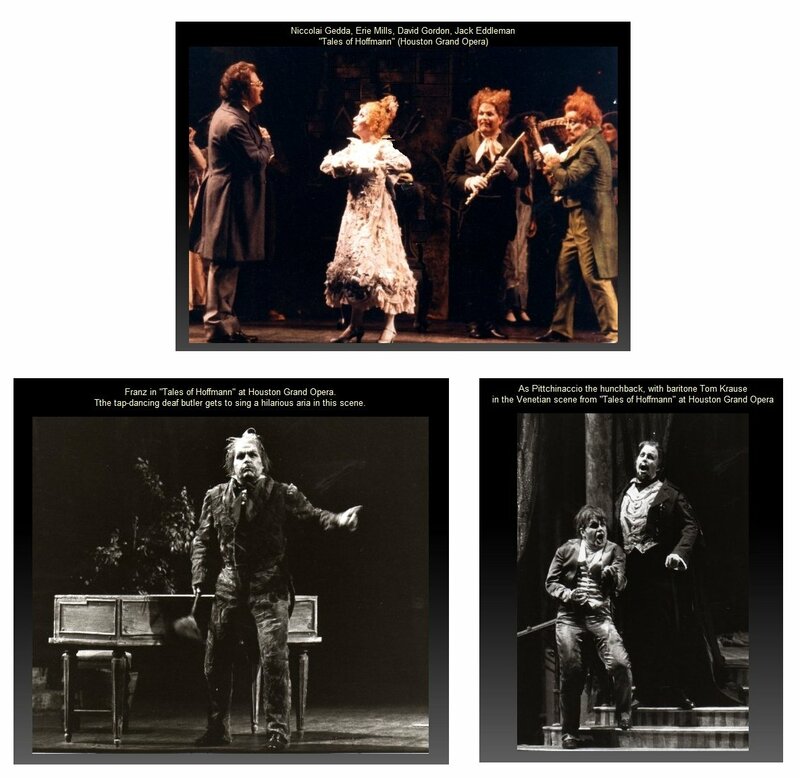 It can even be carried to the extreme, as in the productions by the late Walter Felsenstein who rehearsed things for six months! BD: Can a part get stale if it's over-rehearsed? DG: Not with someone like Felsenstein. As I understand, he was constantly challenging you to find new things in it, but certainly with routine staging, a piece can get over-rehearsed and you start getting sloppy. BD: What if you have quite a number of performances of the same role? DG: The only time I've done that kind of thing was a series of Brigadoons. We did about 28 performances in maybe 33 days, and after the tenth performance things started to get wacky! Then the director came in one night and had a fish -- a foot-long slimy dead fish -- and said he was going to give it to someone during the performance, and that person was to pass it along to someone else. All this was on stage during the performance, and we spent the whole thing looking around and wondering who had that fish. Sure enough, during the wedding scene, I felt this slimy thing in my hand and I realized that I had the fish. I was wearing a kilt and had no place to put it, so I just kept going for a few minutes until I had the chance to pass it along again. Now that performance was the most electrifying of the run, and it kind of woke us up! He did little gimmicks like that a couple of times. In that kind of situation, you have to change something -- a bit of staging or the furniture -- because there's a real danger that after awhile you must go in, do your piece and leave, and it becomes just a job. It's got to have that opening-night excitement to some extent every night. The second performances are always a little bit of a let-down after the opening, but when you do seven performances like we have here in Chicago, the third or fourth performance is routine, but it also has a high level of emotion. BD: Should the broadcast and review performance be this third or fourth rather than the opening? DG: I think so. The broadcast should definitely come from them. The reviews, though, would be hard because it's opening night and everyone wants to know how it went. BD: Do you steal ideas from other performers? DG: Sure -- a bit of business or a characterization or a bit of phrasing or vocal coloring; any building block. I think I have enough creativity in me that I can do it without just mimicking or copying. It would be dangerous if I were to just copy, but I draw from here and there. You've got to do that. That's one of the great things about recordings -- you can learn from a great number of artists instead of relying on one coach. I've copied things like a painter will copy an old master, just to learn bits of technique. I studied with Luigi Ricei and he said genius is 90% imitation and other 10% is the ability to take that copying and make something new, to make it your own. BD: Are there any good twentieth century operas? DG: There are operas written in the twentieth century that are good. Peter Grimes is a great opera, and I don't use the term "great" lightly. BD: Would you ever do the role? DG: Oh, I'd love to do it. Here's a part that Peter Pears did in his very lyrical way. Jon Vickers is singing it now, so it would be very hard for me to step into it, yet it's a part I would dearly love to do. BD: Have you done any of the other roles in that opera? DG: No, I've never sung any Britten operas. I've done lots of his other music, but none of the operas yet. I'm lucky that Britten wrote all that music for Pears because I can sing it all. There are hardly any Britten operas that I would not like to do. I'd love to do Albert Herring, and I would have if I'd stayed in Germany. That's the one that's well loved there because it makes fun of the British. They do it very much tongue-in-cheek, making fun of those quaint British ways. I saw it in Kassel where a false proscenium was made to be like a basset-hound that curled around to watch the whole proceeding. It was a wonderful effect and is certainly the German idea of the British eccentrics. BD: Is it still the way to go for a young singer -- to head for Europe? 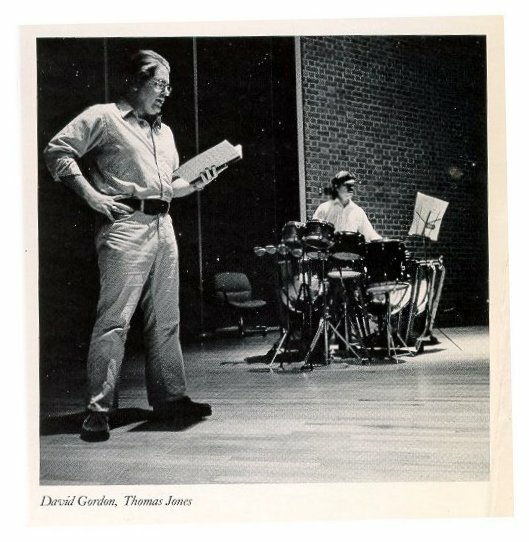 DG: I was singing two or three performances every week, with no more than 15 or 16 of any one opera. So that way you learn and grow. By the tenth performance, you know everything about the staging and what's going to happen, so you can take 10% of your brain to look around and experiment a bit, stepping back and looking at yourself as objectively as possible. That's the advantage of being in Europe -- being employed on a monthly basis and singing regularly. It lets you grow artistically. BD: Will you go back there now? DG: I would, but as a guest, not under a year contract. I'd like to keep my contacts there. BD: Do you ever wish you were a bass? DG: No. It's funny that you should mention that. I've never had any desire to be anything but a tenor. I like the roles that I do very much. If I could have the devil come to me like he does in Faust, I would want to be the greatest Cavarodossi in the world for a year, and on the last performance on New Year's Eve, I would have them put real bullets in the rifles and kill me on stage. On the other hand, if I actually did sing roles like Cavarodossi, I couldn't do some of the Bach and other wonderful things that I sing now. BD: Do you see yourself growing into those heavier parts? BD: Is it hard doing all the traveling you have to do for your career? DG: It's hard. It's very hard for my personal life and my wife and I have to work at it all the time because we are apart so much. I don't enjoy superficial relationships. I find them distracting and draining. I think our aim is to have my wife come with me for longer periods, but she has her own career and I don't want her to just sit around while I go off to perform. It's not an easy life for a singer in the States because you're traveling all the time. BD: You wouldn't rather be a carpenter or a radio announcer . . .
DG: I was a radio announcer in high school and I liked that very much. But I've been spoiled for the last 12 years doing this and I don't think I could ever handle a 9 to 5 job again. I almost became a restaurant owner. I went to Europe and auditioned, and they all said "we'll be in touch" but I came home without a contract. So I had been accepted in a school which teaches cooking and bookkeeping and all the things you need to open your own restaurant. I said if I don't hear by a certain date, I'll do that. On that self-imposed deadline day, my contract arrived from Linz! Talk about fate, but that's how close I came to it. I could be happy doing something else, but I am happy with this career. BD: Do you still take lessons? BD: Will you always take them? DG: Probably, if I have someone to take them with. I'm lucky to be still studying with the man I started out with at the age of seventeen. He really got me off on the right foot. BD: Did you decide at seventeen to be a singer? DG: No. I was going to be a teacher, but after a year or so I was told that this was the direction I had to go, and that was that. But your voice isn't really ready until your mid-twenties. A violinist would have been studying for twenty years, but a singer maybe five or six by that time. Kraus didn't start singing until twenty-nine, and Gedda was a bank teller when he was discovered. BD: Are there too many bank tellers waiting to be found? DG: Awww, yes. There's nothing worse than a frustrated singer, nothing more pathetic, frankly. BD: Are there people who don't make it who should? DG: Sure, and there are a lot of people who make it who shouldn't. There's so much more involved than just a beautiful voice -- nerves, ambition, desire, intelligence, acting, etc. There are a lot of people who have everything going for them and it just never happens. BD: I'm glad it has happened for you, and I hope it will continue for a very long time. DG: Thanks, Bruce. I do, too. This interview was recorded at his hotel on November 20, 1981. Segments were used (with recordings) on WNIB in 1987, 1989, 1992, and 1997. 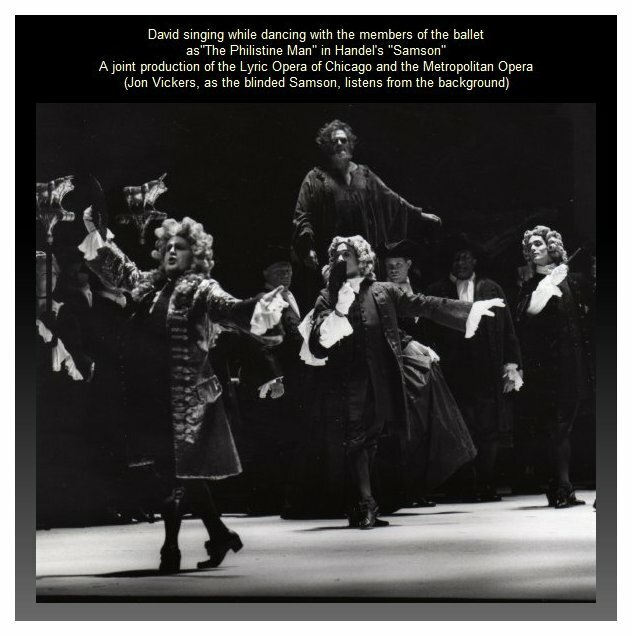 Portions were transcribed and published in Wagner News in April, 1982, and in Opera Scene in November, 1982. The full transcription was re-edited and posted on this website in 2013.